Download this in Adobe PDF format. Insulation is one of the most important elements of an efficient home. Making sure you have enough insulation, and that it’s properly installed, will help you cut energy waste and reduce your energy bill. Floor: The entire joist space should be filled with insulation. Re-secure falling insulation up against the floor with twine, wire, or lath. Insulation only works when it is kept in contact with the house. Exterior walls: R-11 or greater. Knee-walls, which are the short walls located between side attics and 2nd floor rooms, should be insulated. Side attic access doors should be insulated, weather-stripped, and should close tightly. Furnace ducts: Duct work in crawlspaces, attics, garages, or other unheated spaces should be R-8 flex duct or R-11 metal duct wrap. 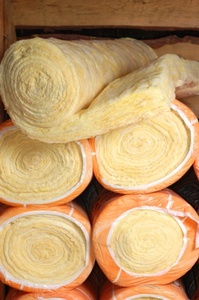 Blanket insulation is available in rolls or bats. It is usually made from fire and mold resistant fibers, and is placed tightly between the joists or studs in exposed walls, floors, and ceiling. Blanket insulation is fairly easy to install yourself. Blown in or loose-fill insulation is made up of loose fibers or pellets that are sprayed into place using special equipment. It can be blown into open spaces, like attics, or through small holes into existing uninsulated walls without removing drywall. Blowing in insulation generally requires professional insulation or the rental of an insulation blower. Rigid board insulation has a higher R-value than batt or blown-in insulation, but is also more expensive. The rigid boards are lightweight and easy to cut and handle. It’s best for exposed walls, floors, and ceilings. Spray-foam insulation must be mixed on site and is best left to a professional installer. It is sprayed in place using a pump driven spray gun, then trimmed to fit and covered with drywall or other fire-resistant material. On a cold day, go outside and look at your roof. If it’s solidly frosty, that’s good! If some parts are melted and you can see the rafter outlines, but your neighbor’s roofs are frosty, you should add insulation in your attic. Attic insulation works best when it’s installed in an even layer. If you have bare spots and piles, use a rake to evenly distribute the insulation. Avoid using your attic as storage space. Flattening insulation makes it almost useless. The insulation under your floor only works when it is kept in contact with the house. Re-secure falling floor insulation with twine, wire, or lath. We offer rebates for insulation upgrades for homes with permanently installed electric heat. We also have tips for successful do-it-yourself insulation projects.